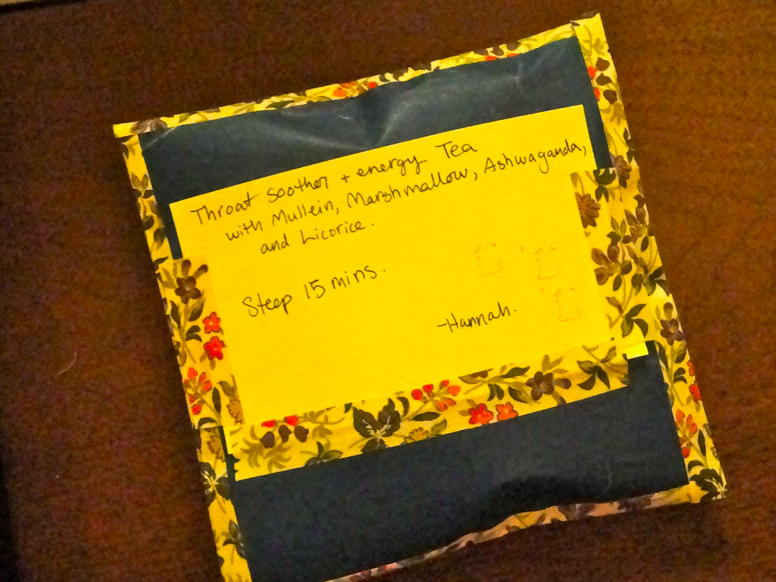 Hannah made us a collection of several different tea bags containing herbal blends. Each tea bag was beautifully decorated with hand-written labels offering descriptions of what was inside and what it would do — plus easy instructions letting us know how long to steep each blend for! A relaxing tea blend made with rose, chamomile and lavender. This blend should steep for 5-10 minutes. A throat soothing + energy pumping tea blend made with mullein, marshmallow, ashwaganda and liquorice. This blend should steep for 15 minutes. 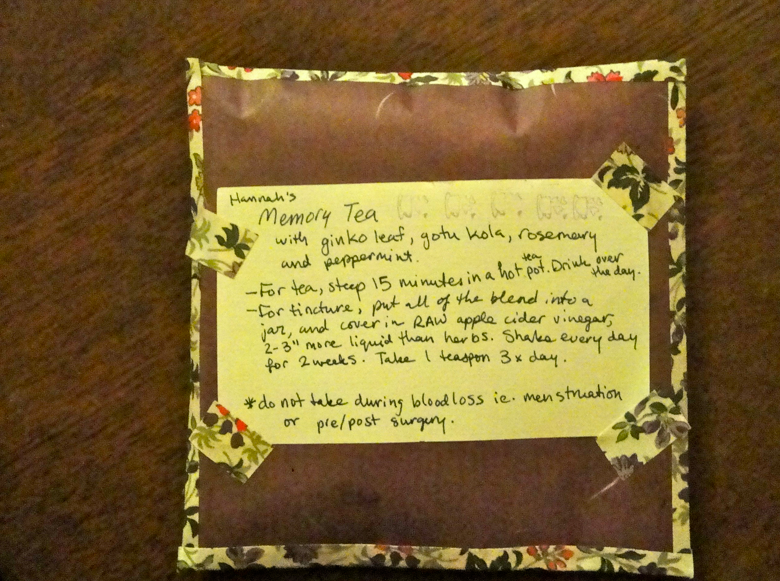 A tea blend made to treat sinus congestion due to a cold or allergies, as well as to help break a fever. It was made with elderflower, peppermint and yarrow flower. To get the medicinal effects, this blend should steep for 30-45 minutes. A memory tea made with ginko leaf, gotu kola, rosemary and peppermint. To make it into an actual tea, you need to steep it for 15 minutes, but if you’d like to make a tinture, you need to put all of the blend into a jar, cover it with raw apple cider vinegar (put in 2-3″ more liquid than herbs). Shake it everyday for 2 weeks, and then take 1 teaspoon three times a day – however, don’t take this during times of blood loss, i.e. pre or post surgery. Finally, a warming broth mix for cold fingers, toes and bones! Containing calendula, cayenne, cinnamon, ginger and taka marigold, this spicy mix should be combined with onions, garlic, and any other vegetables (it’s best with chicken bones, but fine without). It should simmer for 45 minutes, and, after straining and reserving the broth, it can either be enjoyed on its own, or you can add in new vegetables, beats, grains or meats.